The development of health surveillance information systems using a transdisciplinary, empathetic approach to determine all user needs are met has brought about radical changes to the quality, reliability and usefulness of information collected from the field but has also greatly increased the capacity of field services to engage with their communities and respond to health concerns. Ausvet’s approach necessarily puts all the people involved in disease surveillance in the field at the centre of the design and puts aside the originating, often high-level, central need for better data to meet national priority activities and international reporting obligations. The needs, motivations and interests of field-level stakeholders are met first. The need for better data at the national level comes as a by-product of a human-centred, user-centred design. Everyone ends up winning. Everyone ends up data rich and decisions at all levels are supported by evidence. Field workers act within their communities, are closest to the health problems and concerns and are the most significant contributors of data. Be they nurses in community clinics, district para-vets or environmental/community health volunteers, field workers are the people most likely to identify and respond to health problems but they often work in information-poor and under-resourced environments and are burdened by inadequate, slow and time consuming administrative reporting responsibilities to meet central-level information needs. Traditionally, they see little personal benefit from their reporting, rarely have access to a useful flow of feedback information or see the measurable impact of their vital role in maintaining healthy communities. 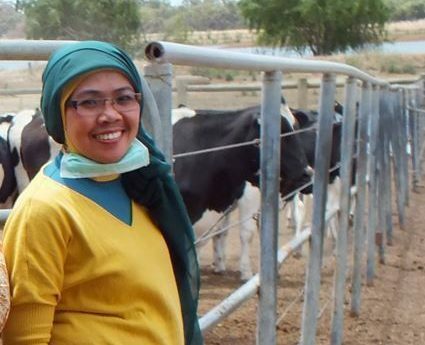 Using an entirely novel, human-centred approach, Ausvet’s work in Indonesia from 2012 onwards turned an inadequate, paper-based one-way information stream from the field to central-level animal health and production offices into what is now arguably one of the best, integrated animal health and production information systems in the world (iSIKHNAS). iSIKHNAS provides quick and easy field event notation tools for data capture and returns information to staff in meaningful ways that value and enrich the data submitted. This allows staff to account for their work more accurately and simply, do their work better, prioritise and target more accurately, make better, evidence-based decisions, gain greater respect from their communities and colleagues and gain greater job satisfaction. The operational efficiency of all the field services throughout the country has been enhanced by this radical improvement to communications, tailored access to information and more efficient use of resources. The system continues to monitor performance at all levels and allows resources and training to be better targeted and evaluated. Useful data is no longer lost through paper-based storage, power is not lost through aggregation, time is no longer wasted in burdensome data handling, health problems are identified, responded to and monitored at all levels and all the stakeholders are kept in the loop, in real-time. Everyone’s contribution can be counted and more easily acknowledged and valued. The system holds that everyone involved in field work has a need for information to support good decision-making and that this data feedback and analysis should be immediate, tailored and responsive to changing needs. Data reporters, in particular, should benefit from tangible rewards – readily available information and analysis, eased workload, improved service and communication, and ongoing, responsive support from the system. Rural communities throughout Indonesia now have faster and better targeted veterinary assistance and the limited resources available are used more judiciously and efficiently. A farmer can register his animals individually and be more involved in following the health and reproductive histories of his cattle. A para-vet can get a list of cases to follow up on in a particular village she is visiting. A vet can see the complete health history of an animal or the treatment regime of a case. A coordinator can assess field reporters’ performance and target advice and support to staff. The training teams can identify local staff weaknesses in diagnostics, treatment advice; monitor what courses are being delivered in different provinces and monitor their efficacy. A district manager can calculate the resources needed during a vaccination campaign because he has a census of animals or conducting a risk assessment of cattle movements from neighbouring districts. A border control officer can view an electronic movement certificate, verify the authenticity and completeness of the movement and ensure compliance of biosecurity measures. A provincial director can advocate for more resources by measuring real efficiencies or identifying priority areas. An inseminator can claim for transport costs based on actual work conducted or order new supplies based on records of client demand. The stocktake manager is happy too because she has records of loss due to breakage and can improve handling mechanisms. Staff interested in antibiotic usage can identify exactly where poor prescribing practices are occurring, target training efforts, and monitor the efficacy of these interventions to reduce the misuse of antibiotics in the field. Public health workers at abattoirs can better sample and report on residues or suspected threats to public health. A drug inspector can check to see that only registered drugs are being sold at community pharmacies and other outlets. The central-level epidemiologists can assess the national level programs in disease control or report to OIE. Ausvet is carrying this approach further, into areas of human, plant and environmental health sectors and then, even further, by creating integrated Research Platforms which allow collaborative research to be conducted on these extraordinarily detailed and integrated datasets. Close to census level in detail and combined from across sectors so that complex analysis of the intricate interplay between these previously siloed domains can be better understood. Integration at this scale is the only way forward for truly holistic, One Health investigations and responses. And it is all due to our commitment to engage and bring most immediate benefit to the people at the coalface – the health workers in the field.